Leicester, England: Viewfinder Photography have released a new portable monolight, the Strobeam EID500. 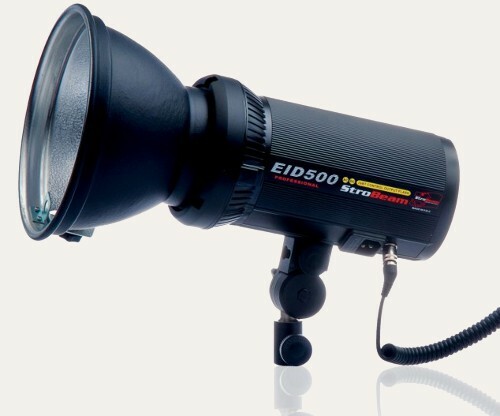 Manufactured by CononMark, the EID500 is similar to the NID500 but features a Bowens S-type bayonet, a metal umbrella mount and better quality Rubycon capacitors. 8 stops control from full to 1/128 power. Lithium ion battery compatible with CononMark/Strobeam DL4, Nikon and Canon speedlights. At Viewfinder Photography you can buy a Strobeam EID500 kit (including head, battery and remote) for £599 plus VAT. Separately, heads are £375, battery packs cost £259 and the EID remote is £49. Each battery pack is capable of powering two flashes and each remote can control up to 30 EID heads (receivers are built-in).